As air acts as a great insulator, the air inside the double-walled lid and bowl helps provide consistent temperatures throughout the cooking process. This feature also means that you need less fuel when cooking. 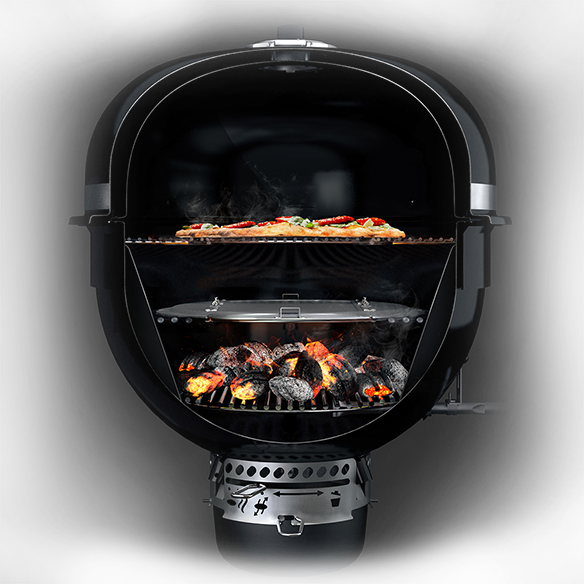 When fully open, the lid damper provides an internal chimney starter effect – making it possible to start the grill fast. Because of the hinged damper design, the airflow can furthermore be boosted so that temperature is increased quickly, and it gives you excellent temperature control. Upgraded, integrated lid thermometer that gives you a quick and easy overview with the indicated cooking zones – such as the smoke zone. The combination of hinge and spring makes it easy for you to open and close the lid on the barbecue with only one hand on the durable and elegant handle. Inside the lid, you will find a lid liner made of aluminium. This makes the lid lighter to lift and, being a great heat conductor and reflector, the aluminium optimises the heat conditions inside the barbecue. The lid gasket is made of braided stainless steel for durability, and also helps optimise the insulation. With this convenient feature, you get fast and easy ignition. With a simple push and turn of the knob, the gas ignites the briquettes/charcoal within 15 minutes. Remove the circle in the middle of the 61cm grate and you can place one of the many different GBS inserts in the grate. With accessory options including a wok, griddle, Dutch oven, sear grate, etc., there’s no limit to what you can cook on your barbecue. By deflecting heat away from the food, this air-insulated stainless steel plate helps maintain a consistent low, even temperature, making it perfect for long cooking times, smoking and baking. The three blades allow you to easily sweep the ash into the ash catcher with just one touch, and easily dispose of it afterwards. The icons also make it clear how the vents are set. C: Open vent setting (allows air to flow through the grill – when cooking in general, this is the recommended setting). The new smoke setting on the One-Touch cleaning system makes it easy to get the right airflow when smoking. Place the handle at the smoke icon and the vent will allow the exact, minimal airflow that is needed to keep the barbecue in the smoke zone. Together with the diffuser plate, this function turns the barbecue into a smoker with optimal airflow. Perfect when you cook food that needs more than 3 or 4 hours of low temperature. The two-position fuel grate provides flexibility whether you are smoking / cooking low and slow, grilling at indirect heat or searing over high heat. For direct and indirect cooking, the fuel grate should be set in the top position. For smoking applications, the fuel grate should be set in the lower position. The shape of the grill provides true convection cooking – where heat is transferred to the food through air. The deep bowl design provides optimal space for two-position fuel grate for all grilling applications. The grill features a durable bottom rack that provides extra storage space for grilling tools, such as the diffuse plate, the Gourmet BBQ System griddle or sear grate, and other items that grillers want on hand. The stainless steel Large Rib Rack provides a convenient way to cook multiple racks of spare ribs, baby back ribs or beef ribs on the Summit Charcoal grill. By vertically placing the ribs in the rack, it will increase the cooking capacity. It holds up to four large racks of pork or beef ribs. Sold separately. This stainless steel expansion rack offers even more cooking surface (56 x 30.5cm) to the Summit Charcoal grill by using the vertical cooking space inside the grill. For easy storage, the legs can be folded. This way, it will take less storage space when the rack is not in use. The legs lock into place for stability. The rack offers 14cm space underneath. Sold separately. This stainless steel charcoal rake offers a safe way to (re)arrange hot charcoal and/or wood chips in the grill. 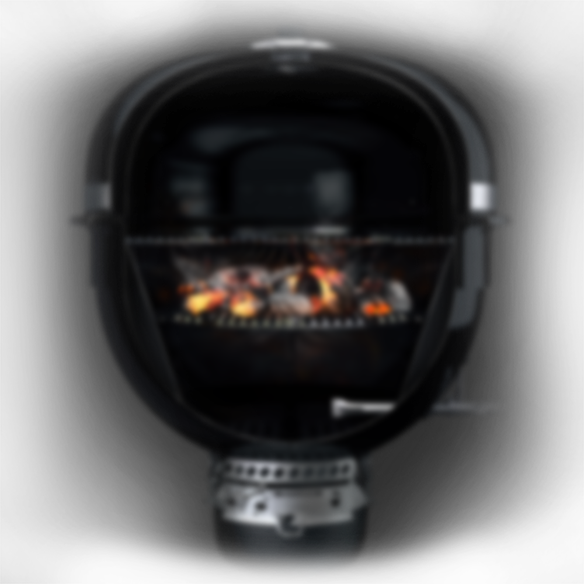 Specifically designed with a 53cm long handle for convenient use with the Summit Charcoal grill. The blade is angled 115 degrees to get the job done most effectively. Sold separately. Specially designed, tailor-fitted premium cover to protect the Summit Charcoal grill from the elements. The cover is UV-resistant, breathable and water-proof to keep the grill dry. Sold separately. The Summit Charcoal grill isn’t your typical grill. 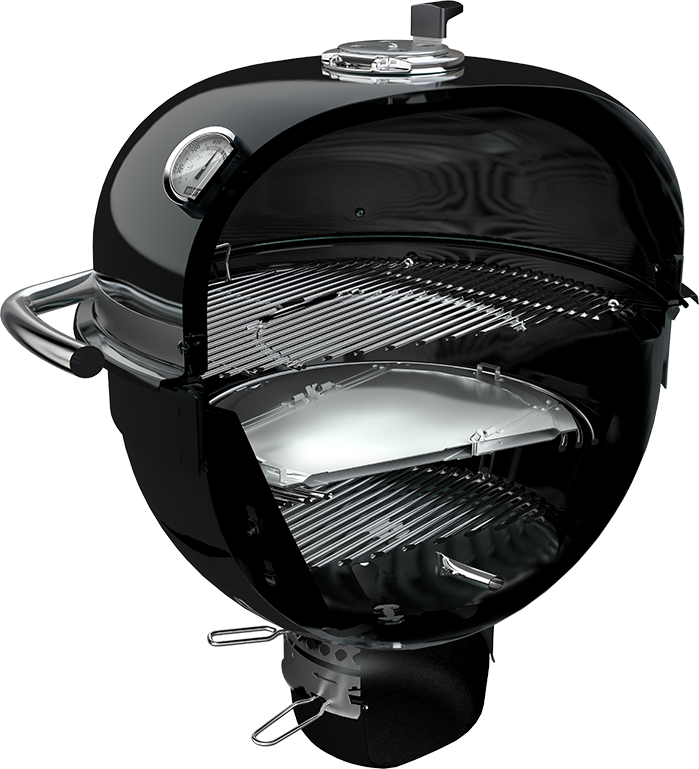 The top-of-the-line features and innovative design allows you to grill or smoke with convenience and ease. From the Snap-Jet gas ignition system to the hinged cooking grates, barbecuing has never been easier or more fun. The Summit Charcoal grill is ideal for all grilling methods, including, among others, direct grilling, indirect grilling and smoking, as well as baking. Barbecuing with direct heat means cooking with the lit charcoal directly under your food. The Summit Charcoal grill is perfect for grilling with direct heat, as you can place the fuel grate in two positions, top and low position, and thereby create extremely strong heat for the food on the grate when needed. The proximity between the briquettes and food on the cooking grates gives the perfect sear and restaurant quality caramelization. In general, if you want to increase temperature while barbecuing, adjust the lid damper to make more air flow through the barbecue. If you want to decrease it, close the vent or lid damper until the preferred temperature is reached. Barbecuing with indirect heat means that the heat is not placed directly under the food or is shielded away from the food. The Summit Charcoal grill is ideal for indirect grilling. The Char-Baskets make arranging the briquettes for indirect barbecuing easy and consistent, while the unique kettle shape provides optimal space for letting the air circulate evenly around the food on the grate. The lid reflects the heat, which optimises the cooking process, and you have the option to place the fuel grate in two positions: top and low position. In general, if you want to increase the temperature while barbecuing, adjust the lid damper to make air flow through the barbecue. If you want to decrease it, close the vent or lid damper until the preferred temperature is reached. Smoking is cooking food at a low temperature over an extended period of time. This technique is also referred to as the ‘low and slow’ method. 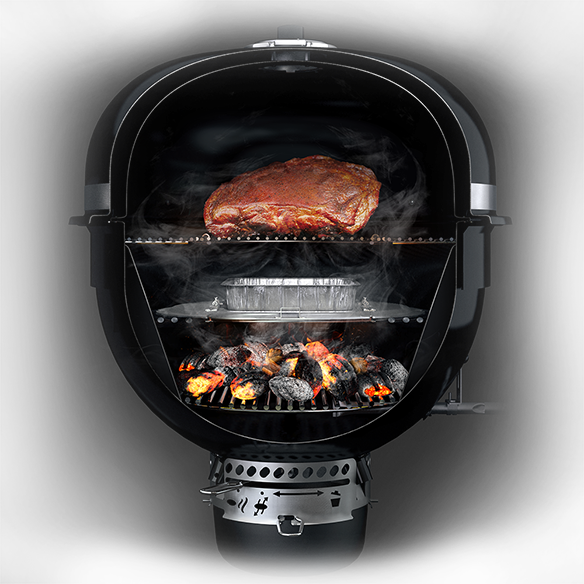 The new smoke / low and slow vent setting, which allows minimal airflow during slow cooking, in combination with the diffuser plate, which deflects heat away from food, allows the Summit Charcoal grill to hold low, steady temperatures for long cook times – without the use of a water pan. Your Summit Charcoal grill is the perfect tool for baking delicious bread, cakes, pizzas and pies. The barbecue capacity provides enough room for the air to circulate evenly around the item being bakes, while the diffuser plate makes it possible to reflect heat evenly to your food. Cooking time: Approx. 60 min. 1. Remove the fat and tendons from the beef. Then cut into 2 cm cubes. 2. Peel the onions and chop finely. Peel the garlic and crush. 1. Prepare the barbecue for direct heat, but put the charcoal grate in the lowest position. Use charcoal fuel holders to make it easy to switch to indirect cooking. To reach a temperature of 200-220°C, you will need just under two measuring cups of Weber briquettes. 2. Place the Dutch oven in the grate, put the lid on the barbecue and allow the Dutch oven to heat up. 3. Add oil to the hot Dutch oven. When the oil is hot, brown the meat. Add the onion and garlic, and fry off for a couple of minutes. 4. Add the paprika and tomato purée, stirring until evenly distributed. 5. Remove the Dutch oven from the grate and move the charcoal fuel holders so you can cook with indirect heat. 6. Put the Dutch oven back on the grate, then add the chopped tomatoes, baked beans and water. Put the lid on the oven and close the lid on the barbecue. Allow to simmer for about 45 minutes until the meat is tender, stirring frequently. Add the cheese and stir in 15 minutes before the end of cooking. 7. Season with sambal oelek, salt and pepper. 8. Serve with cornbread, crème fraîche and salted peanuts. Tip: More water can be added if the chilli gets too thick. Tip: Minced beef can be used instead of beef shoulder. 1. Peel and wash the potatoes, then slice thinly. Peel the onion and chop finely. Melt the butter. Turn the slices of potato in the melted butter together with the onion. Season with salt and pepper. 2. Attach the cup to the poultry roaster, then line the base and sides with baking paper. Layer the slices of potato in the poultry roaster. Season carefully with extra salt and pepper between the layers. 1. Prepare the barbecue for indirect heat. Use the equivalent of one and a half measuring cups of Weber briquettes to reach 200°C. 2. 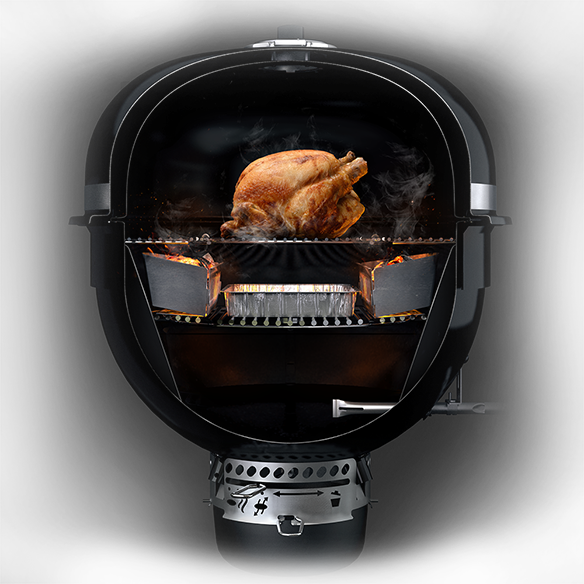 Place the GBS poultry roaster in the grate and close the lid on the barbecue. Cook the potatoes for 40-45 minutes until they are tender. Cooking time: Approx. 40-50 min. 1. Wash the baking potatoes and clean off any soil. 2. Cut a cross in the potatoes, but not all the way through. Wrap individually in aluminium foil. 1. Prepare the barbecue for indirect heat. To reach 200°C, you will need the equivalent of two measuring cups of Weber briquettes. 2. Place the baking potatoes in the centre of the grate, close the lid and bake for about 40-50 minutes, depending on size, until tender. 3. Remove the potatoes from the barbecue and unwrap. Squeeze them slightly so that they open up, and serve with butter and salt. Cooking time: Approx. 15 min. 1. Combine all the ingredients in a bowl and stir into a uniform mixture. 2. Brush the tins with oil and half fill with mixture, which will rise during baking. 1. Prepare the barbecue for baking. To reach a temperature of approx. 220-230°C, you will need the equivalent of two measuring cups of Weber briquettes. 2. Place the tins containing the cornbread in the centre of the grate, directly over the diffuser plate. Bake for 15 minutes. Check if the bread is ready by inserting a small knife – if it comes out clean, the bread is done. Allow to stand for 5 minutes before serving. 1. Score the skin on the pork shanks in a large criss-cross pattern. 2. Peel the shallots. Wash and peel the carrots and celeriac. Chop them and the washed leek into rustic pieces measuring 2x2 cm. 3. Peel the horseradish and grate finely. 1. Prepare the barbecue for direct heat, but put the charcoal grate in the lowest position. Use charcoal fuel holders to make it easy to switch to indirect cooking. To cook at 200- 220°C, you will need the equivalent of just under two measuring cups of Weber briquettes. 2. Place the Dutch oven in the grate, put the lid on the barbecue and preheat for 5-10 minutes. 3. Melt the butter in the hot Dutch oven. Add the vegetables, the whole shallots and the sprigs of thyme, and fry off for about 3 minutes – do not allow to colour. 4. Remove the Dutch oven from the grate and move the charcoal fuel holders so you can cook with indirect heat. 5. Put the oven back in the grate and place the pork shanks on top of the vegetables. Add the chicken stock and put the lid on the Dutch oven. Allow to simmer for about 2-2½ hours, or until the shanks reach a core temperature of approx. 90°C. 6. Remove the pork shanks and vegetables from the Dutch oven and drain well. Sprinkle the pork rind with salt. 7. Pour the cream into the Dutch oven and bring to the boil. Flavour with salt, pepper and horseradish. Thicken to the desired consistency and add the vegetables. Remove the Dutch oven and put aside to serve with the pork. 8. Allow the barbecue temperature to rise to 230-240°C. Place the pork shanks on the cooking grate when it is nice and hot. They will take about 20 minutes. Check regularly to make sure they do not burn. 9. Remove the shanks from the barbecue. While the meat is resting, heat up the sauce and vegetables. Serve piping hot – with baby roast potatoes, for example. Tip: A little more stock can be added if the dish gets too dry. 1. Wash and clean the potatoes, then cut in half. 2. Wash the thyme and rosemary. Pick the leaves off the stalks and chop finely. 2. Place the griddle in the grate, put the lid on the barbecue and allow the griddle to heat up. 3. Add oil and let it get hot. Put the potatoes on the griddle, cut side down. Fry until golden. This takes about 5 minutes. Then turn the potatoes until tender. 4. Season the potatoes with salt and pepper, and sprinkle with the chopped herbs prior to serving. 1. Clean the potatoes. If they get wet, is important to dry them thoroughly before continuing. 2. Pour 1½ cm of salt into the bottom of the dish. Then arrange the potatoes side by side and cover completely with the remaining salt. 2. Place the ovenproof dish containing the potatoes in the centre of the grate, close the lid and bake for 15-20 minutes. Remove the dish from the barbecue and allow to cool, then break up the salt and serve. TIP: You can save the salt for the next time you make salt-baked potatoes. Cooking time: approx. 30-35 min. 1. Peel and wash the sweet potatoes. Cut into thin wedges and place in a bowl. Combine the oil, acacia honey, salt, pepper and a little chilli powder, and toss the potatoes in the mixture. Transfer to a fish tray. 2. Wash the spring onions and chilli, then chop finely. 3. Wash the parsley, peel the garlic and blend with the oil. Season with salt and pepper. 2. Place the fish tray containing the potatoes in the centre of the grate, close the lid and bake for 30-35 minutes, or until tender. 3. Mix the potatoes with the chopped spring onion and chilli, and garlic oil to taste. 1. Put the flour, cane sugar, salt and baking soda in a bowl. 2. Then stir in the eggs, milk and cream, and beat with a handheld mixer until the batter is smooth and there are no lumps. Transfer the batter to a jug. 3. Wash and hull the strawberries. Put the water, sugar and vanilla seeds in a saucepan and bring to the boil. Transfer to a container and place in the refrigerator. Blend the cold sugar mixture and strawberries to make a smooth purée. Add lemon juice to taste. Place in the refrigerator. 1. Prepare the barbecue for direct heat, but put the charcoal grate in the lowest position. You will need the equivalent of 1-1½ measuring cups of Weber briquettes. 2. Place the ebelskiver insert in the grate and preheat with the lid on. 3. Put a little butter in each hole and three-quarters fill with batter. Cook the puff pancakes a little with the lid on. When the crust is golden, turn through 90 degrees with a small fork or a skewer. Add a little more batter and give the puff pancakes another couple of minutes. Finally, turn all the way. Over the next 3-5 minutes, turn frequently until uniformly golden. Serve with strawberry purée. When you purchase the new Summit charcoal grill, you qualify for an exclusive gift box. 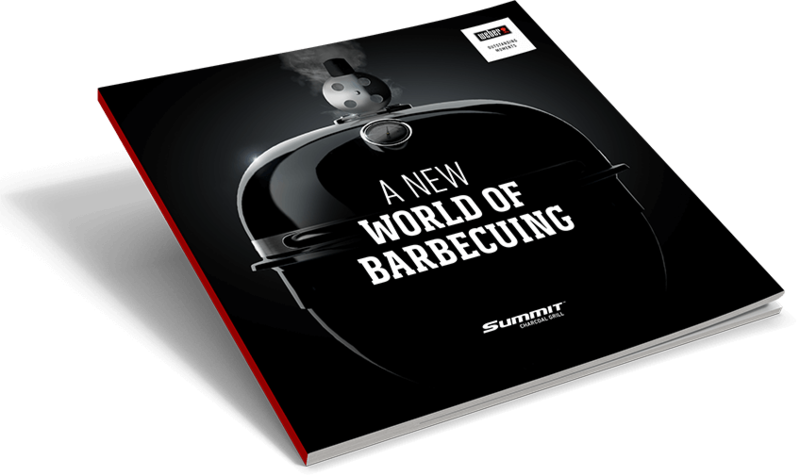 The box includes a welcome letter, a limited-edition booklet with recipes and a free voucher for a Summit charcoal grill course at a Weber Grill Academy (worth €100). 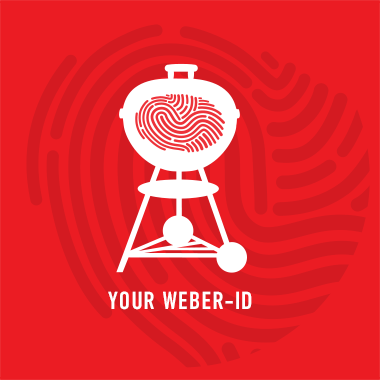 Receive the gift box by registering your grill below.